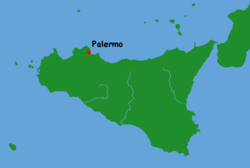 The city of Palermo, located on the northwest coast of Sicily, has a long and fascinating history. Originally an ancient Phoenician colony, it was later ruled by the city of Carthage before it became part of the Roman Empire. In 831 A.D. Arabs captured Palermo, transforming the city into a center of Islamic culture, until, that is, the Normans conquered Sicily in the 11th century (those are same folks who invaded England!). Later the Spanish ruled Sicily, then the Habsburgs, and so on and so on until the unification of Italy. 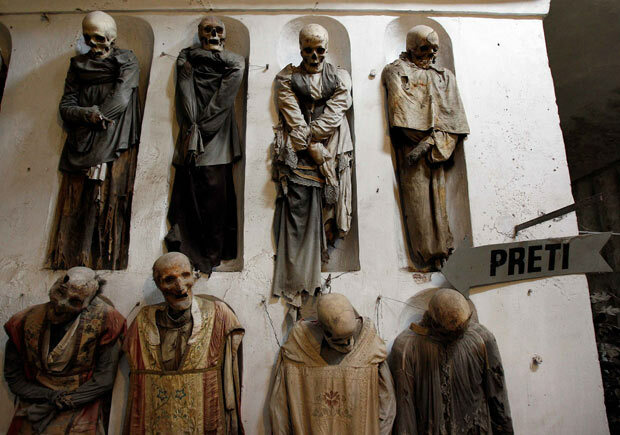 But today Palermo is known for its Capuchin catacombs. Part of a monastery, these catacombs started out as the burial place for Capuchin friars. But over the centuries, for some strange reason, being buried there became a status symbol. All Palermo’s important residents were dying to get in. Their bodies were embalmed, dressed in fine clothes, and hung on a catacomb wall so their loved ones could visit often and pay respects. In exchange for this honor the family paid a small fee (actually, it was a donation), and when the money stopped coming in, the bodies were moved to a shelf somewhere in the catacombs. The practice only stopped in the early twentieth century. More than 8000 bodies – er, mummies – are interred here. A couple of years ago we took a family trip to Sicily, and when my kids heard about the mummies in Palermo, they insisted we check them out. Let’s just put it this way: gross!!! (You can see what the catacombs are like by watching this YouTube video – yuck!) The whole experience caused me to think more deeply about human mortality, and inspired me to write a poem. If you pay the entrance fee. Knowing they’re a great attraction. Their bodies in this gruesome way.